Hall Consulting & Research is a professional services firm that specializes in assessing the financial and strategic impacts (costs, benefits, ROI) of IT investments to support decision-making and planning. We also help leading IT vendors assess and credibly communicate the business value of their products. Our work is highly credible because it is research-based and heavily quantitative. Hall Consulting & Research was founded by Andrew Hall, a leading business value consultant and analyst. Try our innovative add-in for Office 2016 / 365 users. Create/update Word documents based on Excel logic, analysis, data, tables, and charts. Automate your customer proposals, recurring business/financial reports, custom engineering datasheets, and more! We conduct highly credible business value studies to assist IT purchasers in understanding the qualitative and financial implications (ROI) of technology investments. Engagements typically include: assessment of the existing customer environment (maturity levels) and the proposed solution; identification and quantification of costs, benefits, and risks; financial analysis (cash flow, ROI, etc. ); and development of the business case. HCR has conducted many strategic high-profile business value studies. HCR has influenced over $100 million in IT investments. HCRHCR has developed some of the most advanced/credible business value tools available globally. ROI calculators are used by enterprise technology and business decision-makers to develop business cases for IT investments. They are also used as sales tools to help customers credibly understand the business value of technology vendor solutions. HCR conducts research to quantify and articulate the financial and strategic impacts of information technology on business performance. Research focus: the most credible methods to assess the business value of technology; impact of technology on firm performance; strategic and financial impacts of a variety of IT initiatives; and most credible sources of actual costs and benefits. 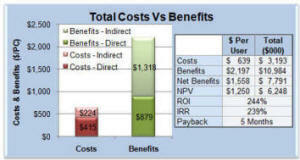 HCR also conducts multi-client studies to determine actual initiative costs and IT-enabled benefits. Our consulting studies, tools, and marketing collateral are based on the most credible research/sources available. HCR is a leading business value analyst and modeler. We create highly credible research-based business value marketing collateral, including whitepapers, case studies, and presentations. These are based on individual or multi-client business value studies, 3rd party research, or theoretical models. HCR has been influential in credibly articulating the business value of technology products and solutions for leading technology vendors such as Microsoft and Intel. HCR develops and delivers customized business value training content. This training has helped IT vendors (and their partners) enhance selling effectiveness by focusing on the business value of products/services. Business value training also helps IT and business managers make more effective/credible IT investment decisions.